In the process of downgrading my stereo system, I wanted to get a pair of bookshelf at reasonable price. Of course, being an Axiom’s satisfied owner in the pass, I thought the M3 could be a good option. I wanted to stay in the sub of the 500$ price range. I was open to used equipment, which I firstly thought it could give me better ratio price/quality. However, the little M3 was on my list for sure. 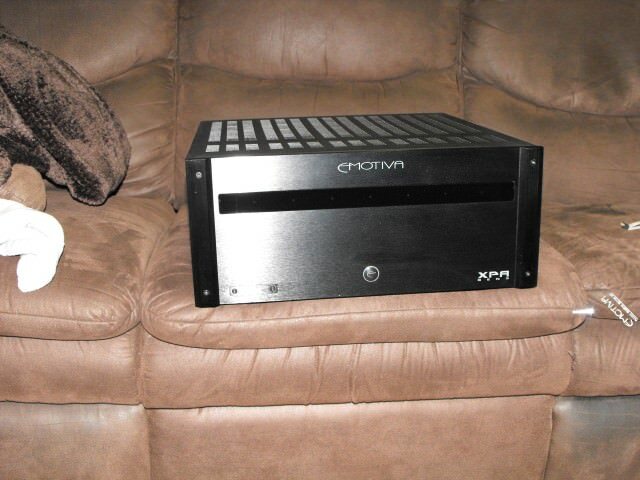 I said I have been an Axiom owner in the pass, well it consisted of a full home theater system: M3 – VP150 – QS8 – EP350 that turned to be a set of M80 – VP150 – QS8 after a few months, all from the V2 version. So you got an idea of what experience I have had with Axiom. So the M3 has been a part of a small stereo system for a short time and while I thought it was a good speaker, it certainly didn’t gave me the musicality I would want (let’s say full range sound), but being fair, we speaking of a 350$ monitor (4 years ago). Anyway, few weeks ago I pulled the trigger for a brand new pair of M3 (Russian Maple with Die-Cast option), I know most say die-cast isn’t bringing anything to the party but I will develop a little more lately. I asked Brent from Axiom Audio who’s says: The die cast basket is much weightier than the stamped basket and will dissipate heat faster, bringing up efficiencies while lowering distortion. This in turn allows you to send greater power to the woofer. Also, at higher output, there is the possibility that a stamped basket could ring, the die-cast will not ring at all. I received the speaker few days ago. While the Russia Maple finish is beautiful, there is the standard, but high quality, craftsmanship from Axiom. Some minor changes caught my eyes. Firstly, of course, the magnetic grill which makes the speaker looking neat. The woofer border looks heavier and there is an Axiom logo on the lower woofer which I think gives a good touch of personality. Furthermore, I noticed the binding post has been changed, hard to remember if they are now higher quality but they works and feels good. The very first hours on these speakers were awful. The sound was tiny and veil. The bass was absent and I remember saying to myself Oh no what I did. While not bad I said to myself they sounding like I recall. But few hours later, 15-20 hours, they really started to open up and get fuller. From what I remember, I know some active guys here aren’t very agreed with burn in time but believe me it was day and night! At this time they might have 50-60hours and they only gets better every day. The voicing is now excellent, male and female voices are full and extended. The mids are good, not forward but linear, and the bass is accurate and tight. They sit 8 feet’s apart and 3 feet’s from the front wall so they are well clear to breath without restriction. Actually, the bass is where they impress me the most. Few reviews I have read say they are bass shy, but I disagree. While certainly not deep and heavy, the bass it tight and play with authority when you push them. Does it can come from the Die-Cast woofer? I do believe yes because they certainly didn’t have that bass scale in the pass (V2 version). Brent says they are 1 pound and half heavier than the standard version, it surely brings something. Now, my M3 got body, authority and power to gives me soundstage and musicality I haven’t felt from the V2, and I have a very large room! Are they perfect? None are, but at this price range, I must say they are the surprise of the year. I really don’t feel I downgraded from my last setup, and I had a 5K$ tower speaker. They do everything good and more. Axiom customer service is more that great, I got 5 years warranty, what else should I ask? I am just a happy customer! Bravo Axiom! And by the way merry christmas !! Those are very beautiful speakers, Philippe. I believe there were significant changes to the drivers and the crossover from V2 to V3 also, so the difference you are hearing may not be attributable solely to the cast woofers. That room looks fantastic. I love it. I love my M3s too. I haul them out of my bedroom and put them on top of m 80's all the time and listen to them instead for fun. After all that I've read here about Axiom stamped vs die-cast baskets, there should be absolutely no difference in sound because the stamped ones are designed & heavy enough not to cause audible problems - or so we've been told. I have a pair of M3s on FMS24 stands that are in confined corners of the room that reinforce bass tremendously. I had to EQ the bass down significantly due to this reinforcement to smooth them out in my room. Light on bass they are not. M3s are great bookshelfs that don't really need a sub (or 2) unlike the M2s & perhaps the M22s. Philippe, beautiful room; however, I believe that it is mostly your ears that have gotten better after 50 hours,ha! No need to start a debate about the Standard against the Die-Cast. I am only questioning it and like I’ve ever say, why offering such an upgrade if it absolutely do nothing more. If nothing else, the cast baskets add a sense of quality to the overall appearance,much like aluminum wheels vs steel wheels. Your M3's look fantastic on those stands and you have a awesome Christmas tree.